This is our favorite time of year. Fall is full of everything to be thankful for. Even as the holiday lights and shopping craze tries to take over the blessings of the season, we are humbled by every day wonders. Labs give us perspective on what is important. They know nothing else but to love and adore unconditionally. Simply put, they want to wake up, eat, go to work, do their very best every day, eat, play, (did I say eat? ), then rest beside you at the end of the day only to wake and begin again. The time and energy you invest in your Lab pays you back like no other investment can. SunDown and Robin's puppies are due at any time. Both parents have pedigrees full of champion lines. They have best of health, conformation, and temperament. Both are OFA Good and SunDown also has hips better than 70% of nearly 25,000 Labradors tested by PennHip ! 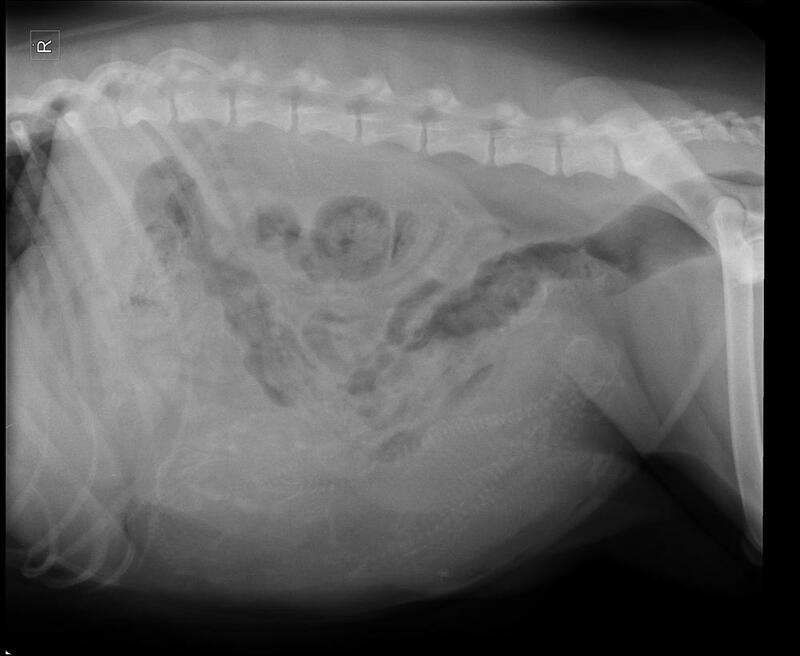 In the X-Ray above, taken this week at Compassionate Care, Dr Keller clearly sees 7 puppies. Today is day 58 from the first breeding and there are gentle signs that SunDown is progressing. She is still eating happily so it may be a few days yet. Preparations are well under way to welcome these CaveInn puppies. Stay tuned for more blessings on the way!